ADA MARY GRIFFIN the daughter of EBENEZER and MARY ANN GRIFFIN was born 16 Dec 1865 in St Olave, Surrey, London She travelled with her family on the sailing ship "Mataura" to Taranaki arriving 11 Nov 1875 and after disembarking at New Plymouth, they preceeded on to Huirangi where their Andrews relations had settled. ADA married HENRY ROWE on 5th April 1890 in Waitara, son of WILLIAM ROWE and HONOR DAW. Henry's father, William ROWE was christened 17 OCT 1827 in Parish of Bickleigh, Devon, England, died 25 APR 1915 in Lepperton, Taranaki, New Zealand where he was buried 27 APR 1915 in Huirangi Cem., near Waitara, Taranaki, New Zealand. 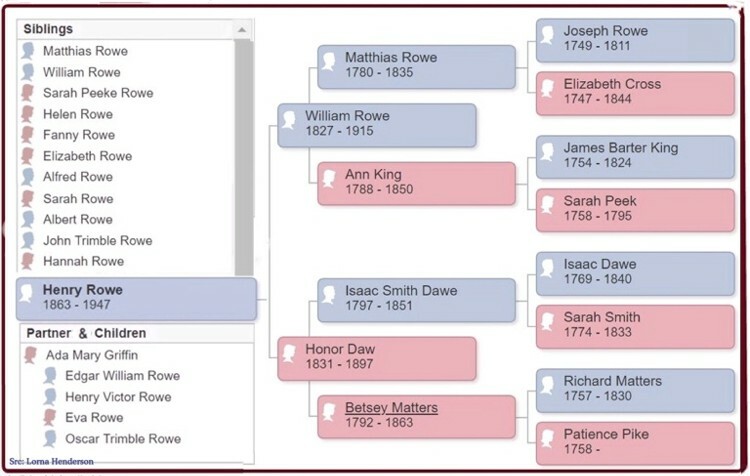 He was the son of Matthias ROWE and Ann KING. Henry was born 25 Aug 1863 in Waitara and was 16 in July 1979 when Maori living near Huirangi took their ploughs in bullock drays to a paddock belonging to Mr. W. Rowe, and. commenced ploughing. Mr. W. Rowe and Mr. G. Andrews went and spoke to them, but finding words were of no avail took the ploughs from them, when the natives all squatted down on the ground. At about ten o'clock a party of constabulary under Major Tuke, accompanied by Major Brown, proceeded to Huirangi to arrest the natives, arriving at Mr. Rowe's farm shortly before one o'clock, Tho natives were not actually ploughing when they arrived, but so soon as they observed the approach of the constabulary, they immediately yoked tho bullocks to the ploughs and commenced operations. There was only one plough and two bullock teams. It would appear that the natives desired. to be arrested, actually having flax in their pockets to tie their hands, and said they had no wish to put the constabulary to the trouble of coming again to arrest them. There were eleven natives, and they had only ploughed a small strip of land round the paddock. They were arrested and taken into into New Plymouth. At the trial, Mr. William Rowe said : I am a farmer, living at Huirangi. I reside upon my own farm there ; I produce the title to same and is a grant from the Crown to myself. On tho 26th instant, at 7 a.m., I noticed Maoris in my paddock. I went to them and found they were ploughing grass land. I remonstrated with them, but it had no effect. I ran to the bullocks and stopped them. They had two bullocks. The driver of the bullocks and I had a "scramble" together. My son then came, and we managed together to unhook the bullocks from the ploughs. Mr. Andrews came, and he helped us. The Maoris persisted in hooking the bullocks on again. They did this several times. At last I got the wheel of the plough and threw it away. I had some struggling to get the wheel. They said they could go on without the wheel. My son got the head part of the plough off and threw it away. There were a lot of native women about, and they brought back the plough wheel and head of the plough. The Maoris kept trying to fix the gear on to the plough again but we prevented them. After that they gave it up. My son and another remained in the field until the Constabulary came. One of the prisoners (Rangihikoa) came down tha road with another pair of bullocks just before the Constabulary apprehended them. The conduct of the prisoners was likely to cause a breach of the peace. The damage done is about this. He desired that the natives be bound over to keep the peace. Henry Rowe (a lad about 15 years old) affirmed that on the 26th natives ploughing on his father's land. A native asked who the Government got the land from. Mr. E. W. Stockman, interpreter, said he went to Rowe's land on the 26th instant with a party of Armed Constabulary. He saw a number of natives standiug quietly by the side of a fence. He was instructed to ask them if they would leave off ploughing however they replied "No." He also said they would not be arrested if they left off ploughing. They replied, "If you do not arrest us we shall commence ploughing again." His Worship told the Interpreter to explain to the natives that they had been charged with ploughing land held under grant from the Government, that they had been proved guilty, and that, therefore, they would be imprisoned on the first charge in tho gaol at Dunedin, for two months ; and on the second they would have to find two sureties in 300 Pound each, and themselves in 500 Pound each, for twelve months. And if the sureties were not forthcoming, they would be imprisoned in Dunedin for twelve months. A Native asked by what authority was the land confiscated - "The Court : Tell him that the land was taken from tho natives after the last war." 26 November 1881 at Huirangi was spent at the rifle range on Mr. Frederick Andrew's farm, Huirangi, in a contest between the right and left sub-divisions of the company ; after which the usual parade of Armed constabulary, supervised by tho Major, in which "evolutions complex to the uninitiated, were performed, evidently to the satisfaction of the Commanding Officer." In the evening a dance took place in the school-room. Mr. Henry Rowe, as M.C.. carried out the programme in a highly creditable manner, and the dancing was kept up with spirit, enlivened at intervals by songs. The youth and beauty of Bell Block and the surrounding neighborhood contributed to the success of a most enjoyable evening. Huirangi access was difficult and made more so when the contractor for the new bridge having cut away tbe log that answered for a foot bridge across tbe Ngataro stream, on 21 September 1887 and Henry Rowe, when trying to cross by fording, was nearly being drowned, having been carried down some distance by the force of the strong current. He managed to catch hold of a boulder, and by a hard struggle managed to escape with the loss of his new hat and a good wetting. After the marriage,Ada voted in first electoral roll for woman 1893, house wife living at Palmerston North.In 1915 they are living at 15 Princess St Petone, Wellington, 1920 at 22 Queen St. Petone and at the time of Henry's death 06 Dec 1947 he had retired from work as a fitter and they were living at 35 Cuba St., Hutt. 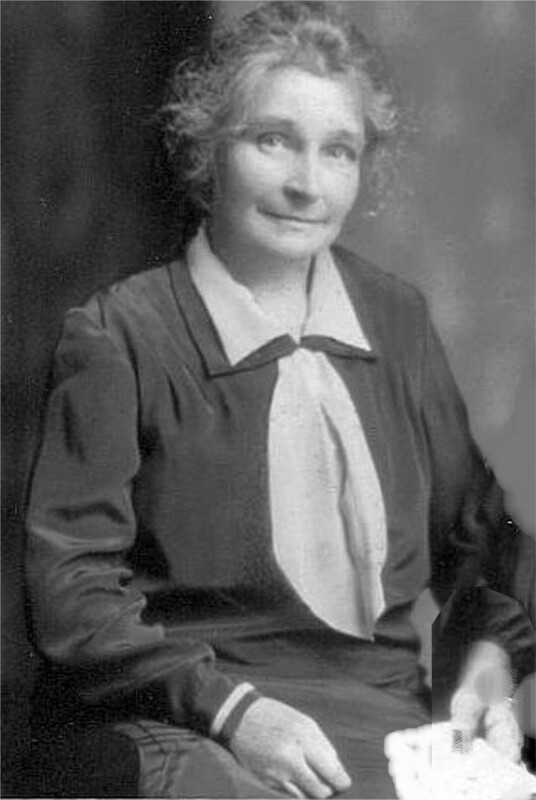 Ada's died 15 DEC 1945 and her burial on 18 Dec was at Taita Cemetery, Lower Hutt with husband Henry. DEATHS. ROWE. On the 23rd May, at Petone, Edgar William, the beloved son of Mr. and Mrs Henry Rowe, aged 14 years and 4 month's. iv. 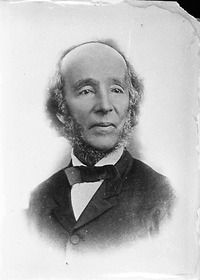 OSCAR TRIMBLE ROWE b. 29 Sep 1900, Petone; Occupation NZEF/Typecaster; d. 17 Aug 1942, bur: at Phaliron, Athens, Greece aged 41 years.